Thank you to everyone who has helped us improve the original Greater Cambridge Partnership proposal for Milton Road. It was to have been hedge to hedge tarmac and is now a greener, pedestrian and cyclist friendly plan. 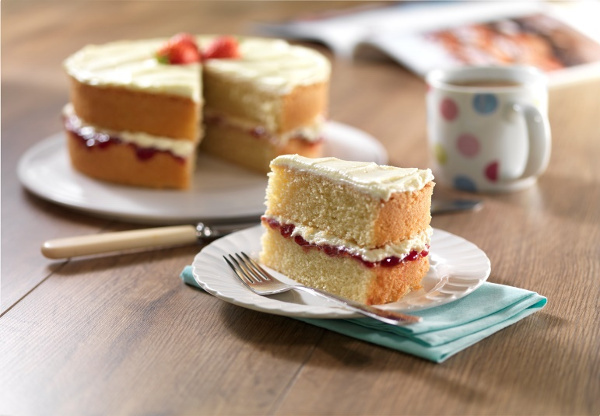 Come and find out more about where we are now over a piece of cake and a cup of tea at our AGM. The process for re-modelling Milton Road has now reached the point where plans have been sent out for public consultation. If you live on or near Milton Road you should have received a leaflet and questionnaire, but you may not have one because the distribution was patchy. However, you can also complete the questionnaire online at https://consultcambs.uk.engagementhq.com/milton-road/survey_tools/MiltonRoadSurvey2018. Please do look at the plans and complete the questionnaire to make your views known. Our reasons are given in Question 2. 11. We strongly oppose the new outbound bus lane because it takes away space that can be used for safe, protected inbound and outbound cycleways and better verges which will allow school traffic in the morning to cycle legally between Highworth Ave and Ascham Road, the most intensely used part of the school route. 12. We feel obliged to oppose the Elizabeth Way roundabout redesign because of the very narrow and unsafe shared-use pinch-points for people walking and cycling. These problems could be fixed by retaining the present single traffic lane on Milton Road outbound at the approach to the roundabout and segregating the cycleway from the footway. 18. 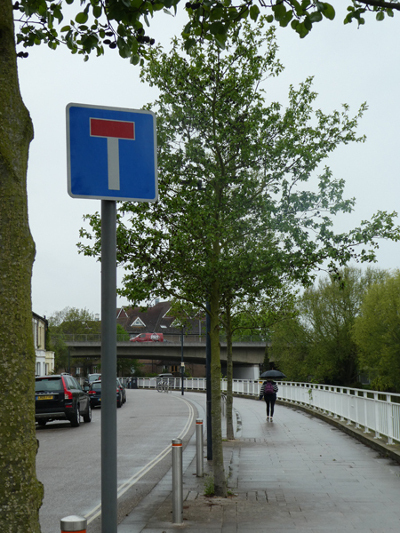 We believe that the inbound bus lane approaching Arbury Road junction is too long and that space would be better used for improved verges and footways. There should be no illuminated advertisements on floating bus stops and the panel on the approach side should be kept clear so that bus drivers can see if anyone is waiting. We strongly support the design of the new segregated cycleways and Copenhagen-style priority crossings. 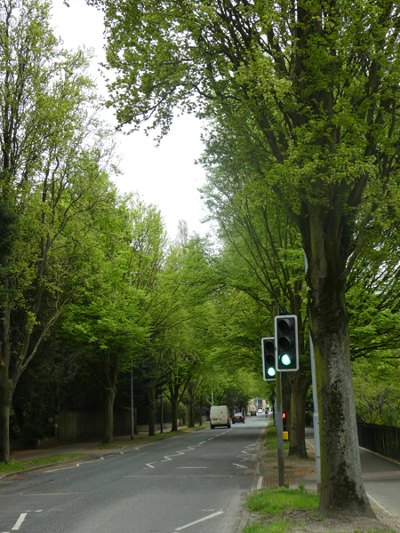 We strongly support the proposed concept for tree planting along Milton Road. We believe that the pavements should be pedestrian only and that cycleways should always be segregated from footways. Not only would a shared-use pavement be unsafe and intimidating for vulnerable pedestrians, it would also encourage people to cycle in close proximity with the many driveways on the north-west side of Milton Road leading to an increased risk of collision with vehicles exiting from driveways. Frequent crossing points over Milton Road are therefore needed. We strongly support the implementation of a Traffic Regulation Order to prevent parking on grass verges. Some form of physical barrier is needed to protect these verges. c. Enforcing the rule that requires those needing longer periods of parking to apply for prior authorisation. We believe there should be a crossing near Westbrook Drive (Option 4A). We believe there should be crossings at both Downham’s Lane (Option 19A) and Fraser Road (Option 19B). This is to help people from the large estates on either side of Milton Road to cross the road and access bus stops and the unidirectional cycleway on the other side of the road. The proposed shared-use pavements are dangerous and intimidating for people with disabilities who are walking or using a mobility device. We oppose shared-use pavements. Instead, cycleways should always be separate from footways. Segregated footways and cycleways are much safer, easier to navigate and comfortable for all users. Where a footway has to cross a cycleway, such as at a bus stop, Zebra markings on a raised platform should be used, preceded by rumble strips on the cycleway and tactile paving on the pedestrian approaches. Additional controlled crossings of Milton Road will help all people to be able to cross the road safely, regardless of ability. The consultation runs from Monday 17 September to Monday 29 October 2018. 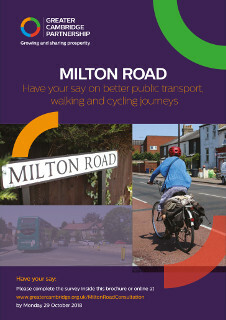 Brochures will be distributed throughout the Milton Road area including the village of Milton, and the consultation is being widely advertised with the use of bus stop adverts, A5 flyers, posters and press releases to the local media. This also includes a social media campaign via Facebook and Twitter. Information about what is being proposed, both the need for the scheme and benefits, as well as further information and how to have your say, can be found on our website at: www.greatercambridge.org.uk/MiltonRoadConsultation. This is the best chance that you will get to influence the future shape of our road and it is important that the planners have your input: after all, you know more than anyone else about the place where you live and the journeys you undertake. Participants: Paul van de Bulk, 2 tree officers (Kenny McGregor, Dinah Foley-Norman), Landscape Architect (Henry Casement), Cllr Joceylnne Scutt and 5 local residents [Dorcas Fowler, Anne Hamill, Maureen Mace, Rowland Thomas, Richard Swift]. KM explained the role of the tree officers and their team. 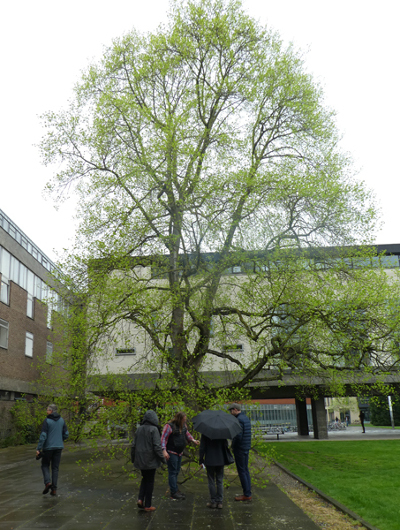 With regard to maintenance, a tour of all the trees in Cambridge was carried out every 3 years to inspect health. 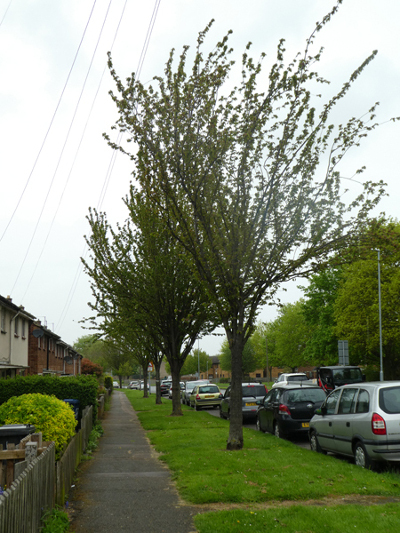 It was important to choose new trees which would withstand the site conditions, be species with best resistance to known pathogens, and those which would enhance the streetscape. There had been mistakes in some of the tree plantings in Cambridge in the past and he reassured participants that learning had taken place as a result of these failures. PvB informed the group that approx. 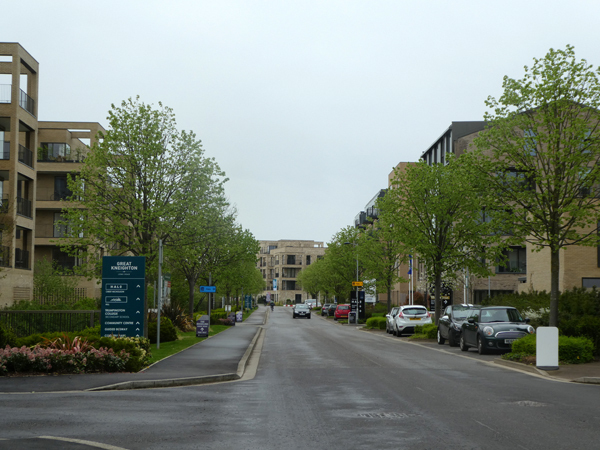 £23million was earmarked for the Milton Road scheme, but no specific allocation for planting as yet. 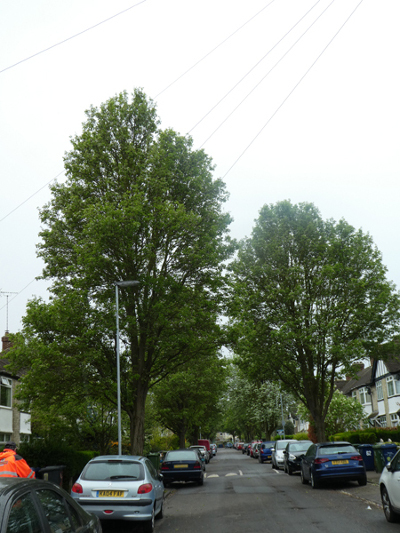 During the course of the tour KM explained that, due to the increasing number of pathogens (possibly as a result of climate change), it was wise to have, say, two species of trees comprising an avenue as a form of protection, these varying on the three different sections of Milton Road. Milton Road was wider in some parts than others and this would affect choice. 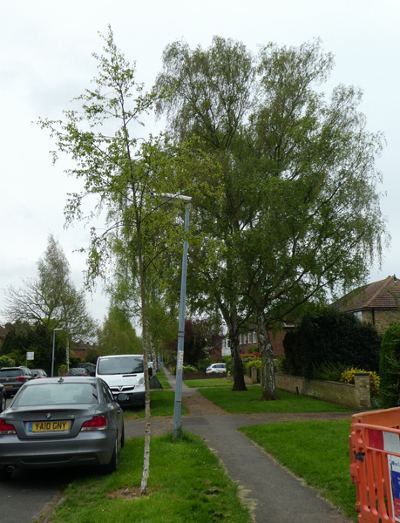 However, there were possible planting areas suitable for a group of trees, not all of the same species, e.g. by the Golden Hind, which could accommodate larger specimens. 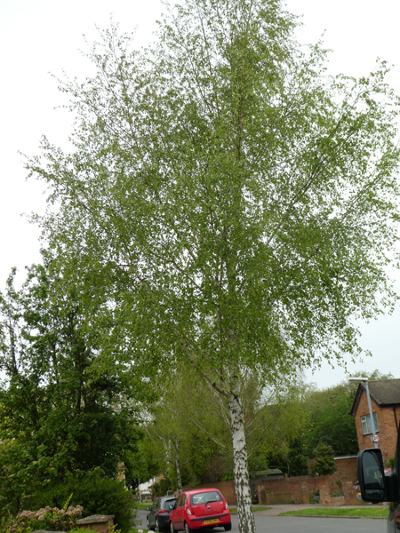 Birches grew well, enriched the soil by fixing nitrogen, were durable (i.e. 80 – max. 120 years), and had low water demand. Species viewed from minibus, Lime trees (not clear whether these were the non-sap producing variety). 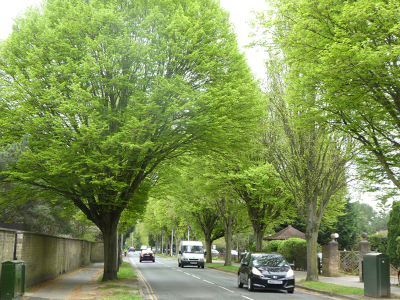 Some Council-planted, some on University land; an example of how mature, medium canopy trees can be planted on a major thoroughfare without causing issues for vehicles. 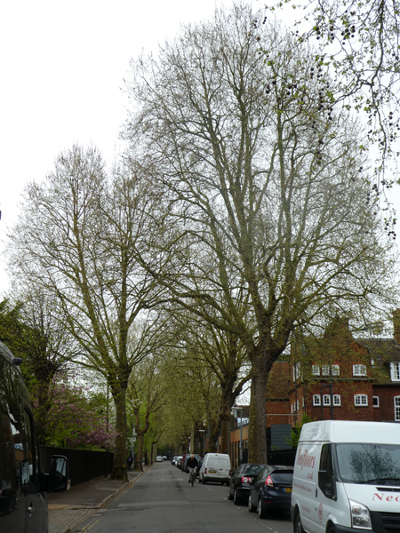 London Plane trees were “bombproof”. Long lasting, surviving pathogens (although some early warning recently reported in Europe), could be pollarded (although this was dangerous to tree surgeons in narrow areas close to roads). In Sidgwick Avenue, roots broke up pavements making problems for push chairs/wheelchairs. Tulip trees were a suitable choice for larger spaces. Lower branches could be pruned. Robust, pollutant- and heat- resistant. No known pathogens. 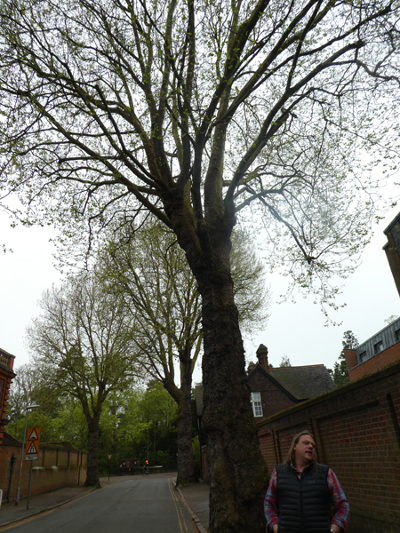 Less flare at base of trunk than London planes. Quick growing. Very costly with regular maintenance in expensive development area. Survival in other areas would be high risk (KM). Flowering pears conical shape, have flowers and autumn colour, grow in poor sites. Suitable for narrower stretches of Milton Road. 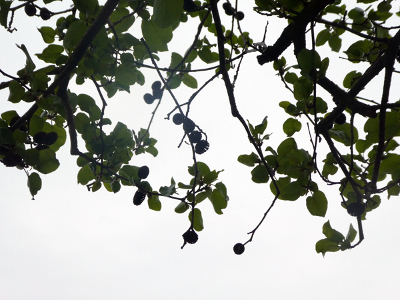 Crab apples – problem with mushy fruit on the ground (objections from residents). 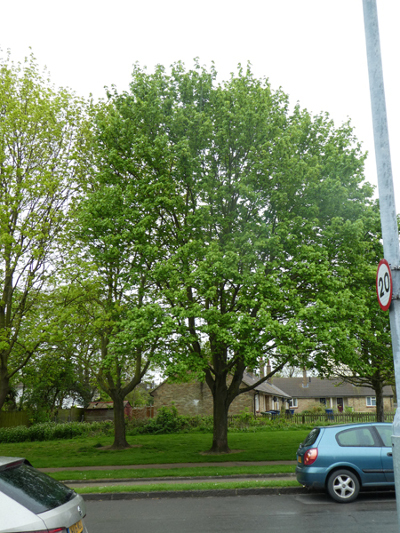 Whitebeam – tough trees, light coloured leaves, get broad but would be suitable for “break out points” along the road. Cherries – upright Y-shaped conical, quite tough, fit in narrow sites. Could use bigger cherry (e.g prunus avium) on corner, say, of a group of larger trees. NB Horsechestnuts being devastated by pathogen, will soon become rare. Commonly used in urban sites in Europe. Well-behaved trees. Rootcell system effective for providing water needed. 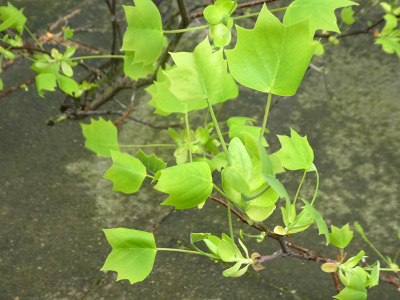 Slender with heart shaped leaves. Yellow autumn colour. There was an excellent turn out of approximately 100 people. Jocelynne Scutt, chair of the LLF, introduced the councillors for the area, the chairs of Milton Road Residents Association (RA), Hurst Park Estates RA and Old Chesterton RA and gave the audience a summary of the original plans and how the residents and councillors had made them more acceptable. The plans described at this meeting are based on the Final Concept passed by the Greater Cambridge Partnership Board last July. Engineers Paul van de Bulk, officer for the GCP and Neil Poulton from WSP consultants gave the presentation and questions were asked following this. We were told there was not enough room for two segregated cycle lanes on the outbound NW side, an inbound cycle lane on the SE side, trees and verges and a bus lane. The engineers had discussed removing the inbound cycleway but this meant cyclists would use the bus lane and paths. They had listened to the residents who knew that unless there were Copenhagen crossings over the side roads, cycling would take place on the road. However there was a safety problem with two cycleways on the NW side as it restricted the view of car drivers coming out of the side roads. Therefore their decision was to have an single inbound and outbound cycleway protected from the road by trees and verges and separated from pedestrians. On the NW side next to the outbound 2m cycleway, they would make a wide path of 3m so it would become shared use for pedestrians and cyclists riding inbound. This happens now, close to Ascham Road, because of the school. Widening the cycle ways and making them segregated along the whole of Milton Road would make them far safer and could encourage cycling rather than using cars. There were a lot of questions concerning the safety of a shared area. More work will need to be done on this. Most bus stops and crossings will stay similar to where they are now with the exception of the stops by Union Lane, which holds up the traffic lights, and outside the Co-op where lorries unload. There will be more work on this. At the workshops residents were given an option of 6 kinds of bus stops. At the time there was disappointment in what we were offered because of the conflict between cyclists and pedestrians and exits from driveways in four of the options which did not give those at the workshops a safe option choice for all users. At the present time there are floating bus stops but Cllr Gerri Bird and other bus users were concerned for those who are disabled as the new plans would make cycling faster. There had been a workshop about trees and landscaping but the specimens offered did not include much choice. 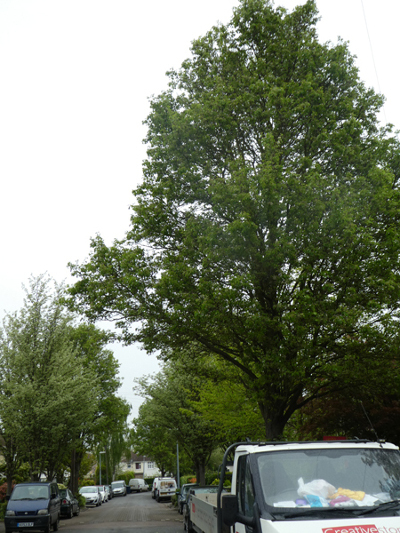 The officers envisage large trees such as limes and tulip trees between the Busway and Elizabeth Way with smaller birches and flowering trees from Elizabeth Way to Mitcham’s Corner. An external landscape architect will be advising shortly so the road has a green feel about it. This requires more work and Cllr Scutt has this in hand. The area will stay a roundabout and will be controlled by traffic lights. Safety is a big issue here especially on the inbound road where cars usually turn into Elizabeth Way and cyclists tend to go straight over. There are concerns too over the entrances to a few houses leading directly onto the roundabout. It is intended that the future design of this area should integrate with that of Milton Road. The inbound cycle path will be next to the path outside the shops here with short term parking in bays for 3 cars with areas for trees between the bays to keep the feel of an avenue of trees. Neil said he had listened to the residents about reducing the bus lanes as they are not used the majority of time. There will be Smart Traffic Lights that will give priority to buses. Bus patronage is falling in Cambridge and the use of the P & R at Milton has dropped by 15%. 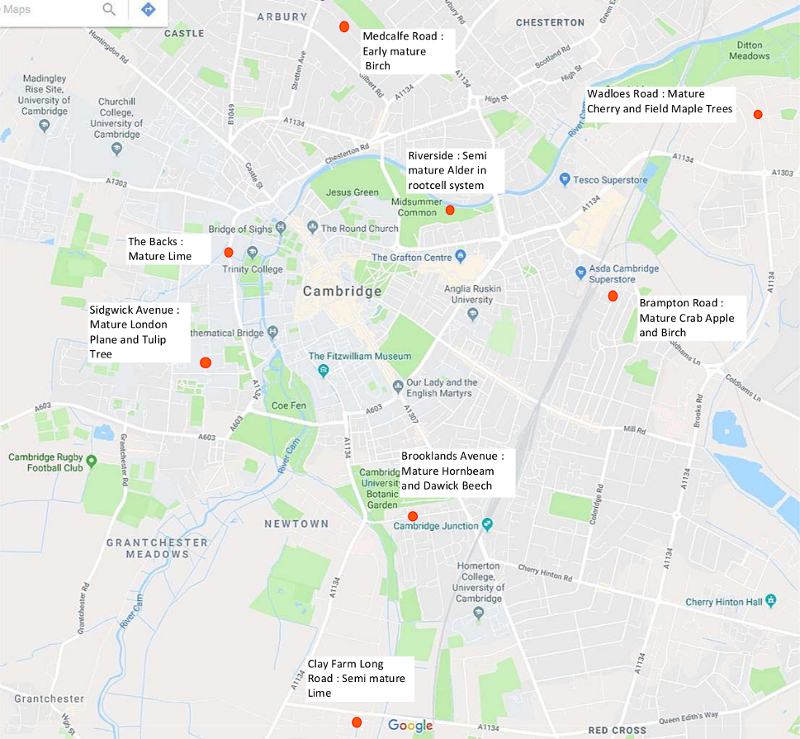 If a metro is introduced for Cambridge it is envisaged more people will travel by public transport so MRRA believe that there will be less need for bus lanes. Paul had talked to the shops owners near Arbury Road. The majority wanted parking for customers outside their shops. The exception was 121 café which encouraged cyclists. The area in front of the shops is owned by the shops whereas the path is owned by the county council. There will be a problem with dropped curbs for cyclists, making it a very bumpy ride, as well as having to give way to cars trying to park. The officers were aiming to make a safer and better environment but to do this some parking spaces may be lost. There will be no parking anywhere on Milton Road. Those with no off road parking would park in side streets. An audit would be carried out to see how many households were affected. Also free dropped curbs, where appropriate would be offered free of charge. To keep cars off the verges there may be deep curbs and trees close together. At the moment some cars from Herbert Road and George Street park on Milton Road as well as some parking there instead of in their drives plus several houses do not have a dropped kerb and park on the verges. There will be another LLF before for next designs go to the GCP Executive Board for approval next July and this will be followed by a wider public consultation.